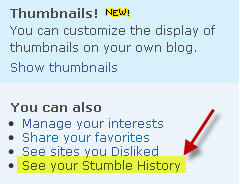 How To See your Stumble Pages History ? StumbleUpon is a great social bookmarking site to add your favorite sites or blogs to your profile. It helps in promoting your sites too, when they are stumbled by visitors which increases your traffic. Go to your profile page and see the right sidebar. You will find a You can also Headline which has the option to show your Stumble History. Click it and it will show you the entire history of pages stumble by you.